I made another financial mistake this past week. You might have remembered when I shared my top four financial mistakes with you a few months ago. Now, let me share my latest error with you in the hopes that you will learn from my mistake and become richer for it. I am here to tell you that the credit crunch and recession are not as bad as the national media would like you to believe….especially for people with good credit. My wife and I bought a new car last week, and like the last car we bought in 2006, we got pre-approved for a car loan by our bank before we went car shopping. Getting pre-approved for a car loan is a great idea, makes the car buying process more smooth and less time consuming, and gives you excellent bargaining power when you face off against the car dealer. The same thing can be done when purchasing a house too. Getting pre-approved can help prove that you are a serious buyer and someone who does not have to mess around with the financing tricks and gimmicks that car dealerships love to press onto buyers. So, last week, my wife and I were pre-approved for an auto loan at 5.24% APR. But, when we got to the car dealership and negotiated, the sales manager was able to lower our interest rate to 5.09% if we financed through the car manufacturers’ financing arm. Just to give you an example, at $25,000 car financed at 5.24% will cost you approximately $474 a month. 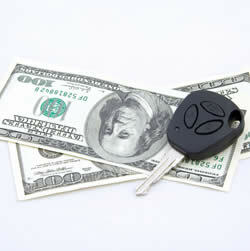 The total loan cost will be $28,440 to repay the car with principle and interest. So, you are paying $3,440 in interest ($28,440 – 25,000). A loan for the same amount at 5.09% will save you $2 a month in a lower payment or $120 less over the life of the loan. So, I saved $120. Where did I make my mistake? I did not call my original bank back and ask them to match or lower the first interest rate that they quoted me. After I had already signed the loan papers, I asked a representative of my bank if they would have matched the rate. They said that they address each request on a case by case basis, but they would not have ruled out matching the new rate I received in order to keep my business. We have just added your latest post “Make Banks Compete Against Each Other To Lower Your Loan Interest Rate” to our Directory of Auto Loan . You can check the inclusion of the post here . We are delighted to invite you to submit all your future posts to the directory and get a huge base of visitors to your website. We have just added your latest post “Make Banks Compete Against Each Other To Lower Your Loan Interest Rate” to our http://www.au-toloan.info. You can check the inclusion of the post, Visit http://www.au-toloan.info/story.php?title=make-banks-compete-against-each-other-to-lower-your-loan-interest-rate/ We are delighted to invite you to submit all your future posts to the directory for getting a huge base of visitors to your website and gaining a valuable backlink to your site. You can still finance your new car loan through your own bank. Almost all car loans are simple interest (the exception being for special financing for individuals with really bad credit). This means if your own bank can improve upon the dealer’s financing simply pay-off the dealer’s loan with a new loan from your bank. There should be no pre-payment penalties. several brand new finance related article(250-300 words) which I wish to post in your site and it will enrich your site. If you agree to do link exchange with me, then both of our sites will be benefited in terms of visitors and page ranking.